“Evening: when the day’s birds are gone and the night’s wanderers wait listening, when dark falls softly as a bird’s wing; then beyond the meadow in the bull spruce, a barred owl, this secretive bird of the deep woods, this bird The Man Who Lives Alone in the Mountains has listened to every summer for so long . . . the barred owl, another one alone, the barred owl, alone, alone, alone, begins his dark melody to the moon.” This sparse yet beautiful prose of David Budbill’s Broken Wing novel opens us to a landscape where outer and inner join. Knowing that the author suddenly died this past September, 2016, after 76 years, adds a certain resonance to the music of this allegorical tale of man—bird—mountain—aloneness—caring. 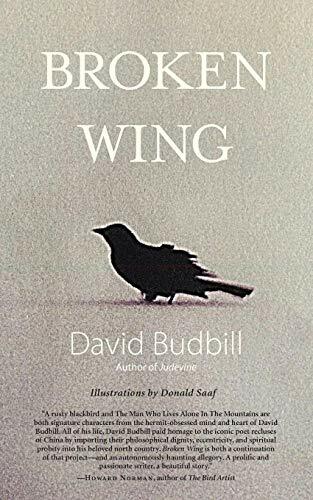 David Budbill, American poet, playwright, fiction writer, jazz flautist, editor, reviewer, and NPR commentator served the world with a keen eye to nature, animal, mineral, and human. His basic stance, though relaxed, was one of Buddhist acceptance and balance as he proved in his nine books of poetry, most for Copper Canyon Press. His last book Tumbling Toward the End is yet to be released in February, 2017. With Thoreau-like precision David Budbill captures the details of the natural world: “And when the morning came, the cold and gray, the dank and chill of November had begun. Rapidly now, the last bit of color, the remaining pale yellows, drained away from the hillsides. Now the skeleton of the world revealed itself; the sere gray and brown of naked hardwood trees stretched their skinny fingers against the sky.” Though Budbill closes off this tale of devotion and will with a labyrinthine suggestion worthy of Jorge Luis Borges, we know that only a poet could write with such lyric precision. The simple, primitive illustrations of Vermont artist Donald Saaf provide charm and fitting character to the work. This is a fine capping work to a lifetime of writing that asked the brave questions and accepted life’s deep mystery. You need not be a bird lover or watcher to enjoy this book, but there’s a good chance you will love both birds and life more by its end.